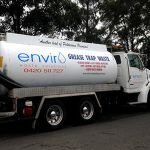 At Enviro Waste Services Group, clients are provided liquid waste management solutions that are reliable and cost-friendly. The company uses only the best materials and the latest techniques to get the job done. Clients enjoy the fixed pricing offered by the company. The pricing includes a unique disposal option that helps clients avoid paying excessive waste disposal charges. Restaurants needing grease trap cleaning do not have to sign any contracts either. Enviro Waste Services Group takes the hard work out waste disposal.